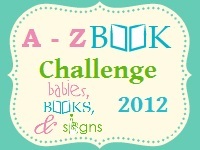 The idea of this challenge is to read a book starting with each letter of the alphabet this year. To join in and for the rules, visit Babies, books and Signs. Here are a few ideas of the books I might read... The list will probably change though.